& Make Your Life Easier. As a property owner you have made a significant real estate investment and you need to make sure that it is both protected and continues to be of growing value. You need to ensure that your commercial or residential property is fully rented or leased, that you have the resources in place to take care of your property, and that there is a focus on getting the best services for your money to keep your property in top condition. Whether you have multiple properties or a single family home, all of this can put a strain on your time and your peace of mind. If you want your weekends back and are ready to have someone manage your investment property, small or large, let’s have a conversation. You will only pay for results. Our management fees are based off rental income, so we only win, when you win. You will never pay any lease-up fees with a full-time management agreement. Turnovers are the most time-intensive part of management. When managers are coordinating turnover work, handling deposits, doing new inspections, new prospect tours, leasing, and screening, it’s no wonder some management companies charge large turnover fees. But not with us. We have an initial small start up fee and then never charge you again for lease-ups. We believe we should be incentivized to keep your property rented at the current market rates, not get additional fees when it turns over. When handling turnover work, we will work diligently to have a smooth and quick turnover at no additional cost to you. You will have a 24 hour maintenance hotline (staffed by local employees from our office). Our employees are on call 24 hours a day, 365 days a year. They are trained to triage maintenance emergencies. We know when to call a plumber, when to wait until normal business hours, and how to troubleshoot simple fixes over the phone. We are the largest and most experienced management company north of Sacramento. Therefore, you can rest assured knowing we’re always on call 24 hours a day, 365 days a year. You will partner with a company that thinks like an investor. That’s because we are investors. We’ll tell you when your rental is under market, or what rehab jobs will earn you the best ROI. Don’t just think of us as managers, think of us as partners. We have our finger on the pulse of the local market and are always willing to share our recommendations with you. You will have both property managers and maintenance experts on your team. Our maintenance division (called Experts in Your Home) is always available to bid any jobs. Whether you need a major re-plumb or someone to clean the unit, we have the personnel in house to make it happen. We offer services such as plumbing, electrical, heating and air conditioning, flooring, cleaning, painting, remodeling, and more. Ready to Learn More? Click below. I want to let you know how pleased I have been with your management services. You and your team have been very professional and extremely knowledgeable as to how to run multifamily properties correctly. I have been impressed from day one. The fact that you had the entire complex leased before we had our Occupancy permit was huge. I was blown away with rents that you were able to achieve, beating our pro forma. Hiring Hignell was a great move for us. As you and I have talked in the past, owning properties in CA is tough, but now that I have found you guys, I would like to find more properties for you to run." – Tyler Edwards, Real Estate Group, Inc. I listed a home for sale of a client of Hignell's and when I went out to meet the tenant they told me that the bathroom had just undergone quite an extensive repair. She said that when the rental was managed by the previous company, they (the tenants) would call the property manager all the time with things that needed to be fixed, but their concerns were never addressed. She said in the short time her home was in the care of Hignell, their concerns were addressed and items were being fixed. I recommend Hignell for both tenants and landlords alike. Having leaks go unfixed is neither good for a tenant or landlord. 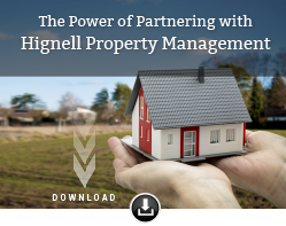 The Hignell Properties cares for their rental fleet and their tenants." - Chelsea V.
You Hired a Property Manager - What's Next?